I was chatting with my frolleague Rick Robinson a couple of days ago about Enterprise Social Networking. Specifically we were talking about how people may feel inclined to put more accurate information in internal Social networking systems such as Lotus Connections than they might do for external sites such as Facebook. I'm not sure if this is true or not, but I gave the example of my own Linkedin account. In a vain attempt to divert attention from my meagre academic achievements (an O'Level in Woodwork) I invented what I thought was an amusing spoof degree, "Applied Quantum Philosophy" which I assumed anyone would see for the joke that is was meant to be. Imagine my surprise then when Dr Rick said, "Oh yes, I studied that at University. Fascinating". Later on he followed this up with an email "PS you pulled "quantum philosophy" out of the air as an example subject when we spoke about collaboration ... 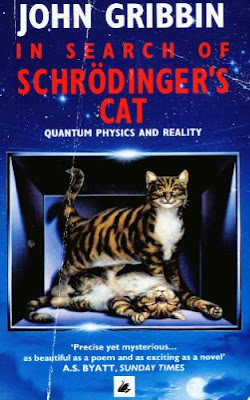 I'd very much recommend the following book on the subject ;-) In Search of Schrodinger's Cat by John Gribbins". That is certainly the philosophy of quantum mechanics. I think I might have to leave the "applied" part alone for the time being though. My cats are stating to look worried. Just noticed your new education on LinkedIn you crazy fool. Of course, I've read a million books on the subject. Quite frankly it makes my head spin, and then Tracy says, "Yes, but how do they know what happened during the Big Bang?" Must say though, that the space is intended for academic seats of 'learning' (trust me, most university grads I know are as thick as pigs' doodoo). It would be a very different thing indeed to specify, for example, that you attended Oxford. If you specified Hogwarts I wonder how many would recognize the name... but not make the connection. Obviously, university grads may not get the joke at all!